The Southeast Asian nations of Laos and Cambodia both rely on agriculture as the traditional mainstay of their economies. Most rural households in Cambodia depend on agriculture and its related sub-sectors, and agriculture provides up to 80% of employment in Laos. Farming systems in both countries are typically low-input and low productivity, dominated by subsistence rice farming with limited animal production. Integrating forages for feeding livestock into existing crop systems is expected to provide more and better feed throughout the year for animal production, reduce labour, and provide ecosystem services, enabling animal production to be intensified. Yet despite these benefits, the adoption of forage technologies has been slow in southern Cambodia and Laos, where low-fertility, sandy soils and climate variability are major limitations. 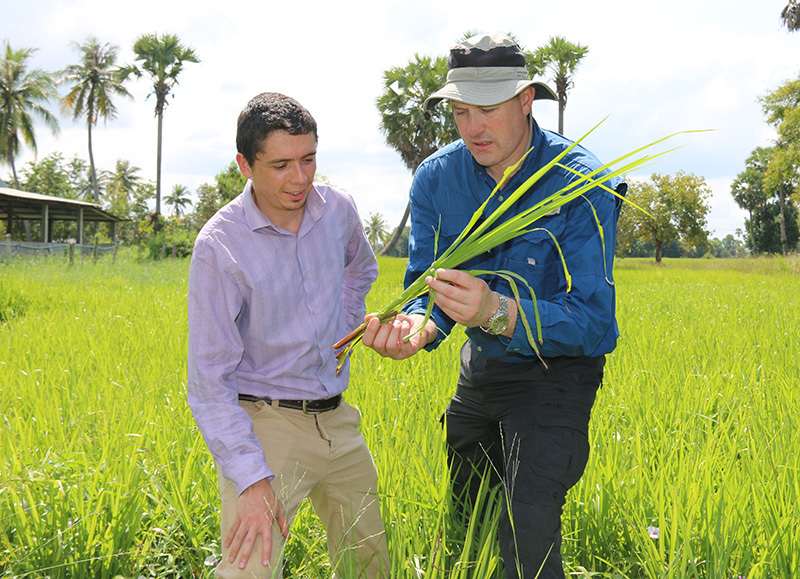 A collaborative project funded by the Australian Centre for International Agricultural Research (ACIAR) is studying the potential for increasing the profitability and resilience of mixed crop and livestock systems in Cambodia and Laos through improved forage and fodder production and better use of water and nutrients. The project involves scientists from the University of Adelaide’s School of Agriculture, Food and Wine here at Waite: project leader Dr Matthew Denton, and key researcher Dr Joshua Philp. “We are investigating what the impediments are to the adoption of mixed crop and livestock systems in southern Laos and Cambodia, and developing appropriate strategies to overcome them,” Matt Denton said. The project will also build technical capacity within the collaborating research agencies in Cambodia and Laos, and within farming communities. In the long term, it is expected that the livelihoods of rural poor in an area with poor soils and highly variable climate will be improved. Widespread adoption of forage technologies could also see an increase in animal health and ecosystem services. “More productive and sustainable agricultural systems in Cambodia and Laos will contribute to poverty alleviation and food security. Intensified cattle production, achieved by sustainable forage integration, will increase rural incomes and ease labour deficits,” said Matt. The growth of the forage sector in the Mekong is also anticipated to have long-term benefits for Australian grazing industries and other supporting industries, potentially generating greater cooperation and markets for expertise, technology and germplasm developed in Australia.